UniversitätsKlinikum Heidelberg: Schizophrenia: genetic alterations linked to functional changes in nerve cells. Researchers from Heidelberg University Hospital have identified 10 previously unknown genetic alterations (mutations) in schizophrenia patients. 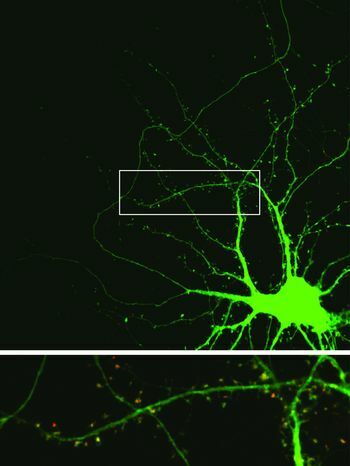 The affected gene defines the blueprint for a scaffolding protein, the SHANK2 protein, which plays a determinant role in the structures connecting nerve cells (neurons). “These 10 gene variants represent risk factors for schizophrenia”, said Prof. Dr. Gudrun Rappold, head of the Department of Molecular Human Genetics at Heidelberg University Hospital and senior author of the article. The alterations have only been found in schizophrenia patients and are not in any healthy individuals. “Mutations that are not found in healthy people could have a direct effect on the disease” says Dr. Slavil Peykov, researcher and first author of the study. The results have recently been published in the renowned scientific journal “Molecular Psychiatry”. The protein SHANK2 is already known to Professor Rappold’s research department from another standpoint: in 2010, they identified several alterations in the SHANK2 gene in patients with autism disorders and intellectual disability. The recently identified mutations in schizophrenia patients reside in the same gene but their positions, and thus their detrimental effect, differ from those previously found in autism. “Modifications in one gene can lead to very diverse neurobiological disorders, such as autism, intellectual disability or schizophrenia. Apparently the exact nature and position of the alteration influences the resulting neuropsychiatric disease and the gravity of the symptoms” explains Prof. Rappold. In the study, experiments with neurons revealed that these mutations alter the connections between neurons (synapses) to varying degrees, in such a way that the communication between these cells is affected. Worldwide, approximately 1% of the population is afflicted with schizophrenia. The disease most commonly develops in early adulthood. The affected patients can rarely lead normal, independent lives without treatment, ranging from needing help with everyday tasks to a complete loss of social and professional functioning. Schizophrenia is classified as a disorder of perception; typical symptoms are delusions and hallucinations, though symptoms and their severity vary from patient to patient. These individuals are also more likely to suffer from other disorders than the general population, such as speech deficits, addiction and depression. The exact causes and triggers of schizophrenia remain to date unknown. In the most recently published study, the SHANK2 gene was investigated in DNA from 481 affected patients and 659 healthy controls, in collaboration with Professor Marcella Rietschel, Department of Genetic Epidemiology, Central Institute of Mental Health in Mannheim and Professor Markus Noethen, Institute of Human Genetics at the University of Bonn. Approximately twice as many genetic alterations were found in patients with schizophrenia compared to people with no psychiatric disorders. “The onset of disease is likely prompted only when further factors are also present, for example, certain environmental risk factors”, explains human geneticist Prof. Rappold. Early diagnosis is paramount to a satisfactory quality of life for the patient; the earlier a patient is treated, both pharmacologically and socially, the less likely they are to relapse and develop further disorders. Therefore, “our understanding of the genetic causes of this disorder could, in the future, help doctors distinguish individual patient groups suffering from similar disease courses, and consequently individualize treatment options” explains Prof. Rappold. If scientists could find exactly which molecules in which molecular networks are faulty in the brain, precise therapies for that particular disease progression could be developed. For example, in the aforementioned 481 schizophrenia patients, 4 non-related patients were found to have an identical SHANK2 mutation. All four patients developed schizophrenia at similar time points and with similar symptoms. If one mutation could lead to a similar set of symptoms and one treatment could correct the consequences of that mutation, the genetic screening for this mutation in potential candidates could very much improve their treatment plan. The close relationship between geneticists, neurobiologists and clinicians should now lead to a better diagnosis and to the identification of knowledge based treatments. Neurons from rat brain (hippocampus), stained with green fluorescent dye. The SHANK2 protein (red) is located in the nerve protrusions (dendritic spines). Dendritic spines are the point of contact between neurons (synapse). Below: Enlarged section. Source: Heidelberg University Hospital. Further information under: Department of Molecular Human Genetics.